Hold your horses: 1) slow down; 2) wait a moment; 3) be patient. The origin of this idiom comes from riding horses or driving horse-drawn carriages. Reins are ropes that are held in the driver's hands and are used to slow and direct the horse. The idiom is often used to tell someone to wait and think about something before taking action. This idiom is most commonly used as a command but can be used in any verb tense form. 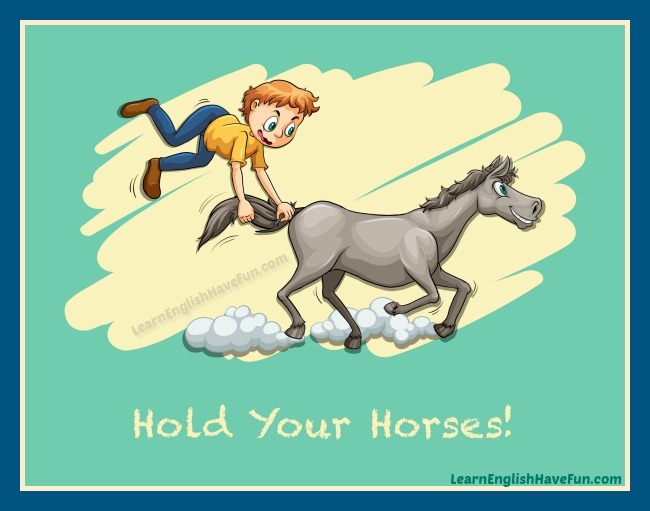 The idiom can be used with any person/subject—hold one's horses—so you could say, "I've got to hold my horses," "they better hold their horses," "he can't hold his horses," etc. Please hold your horses while you drive through this neighborhood—there are many children outside playing. I'm sorry but you're going to have to hold your horses, there are many people in line ahead of you and we are working as fast as we can. Hold your horses kids! The show will be starting in five minutes. I'm tired of telling you to hold your horses. I explained earlier that I've got to finish cleaning up the kitchen before we go. I think we should hold our horses before buying this car—let's wait a few days and make a decision when we're not so emotional. Would you hold your horses for a moment? I can't think when you're pressuring me to hurry. I'm so glad I held my horses! If I hadn't stopped and looked at the departures notice board we would have run to the wrong gate and missed our plane. Mom hold your horses. I know we're late but I'd prefer to arrive to the party alive. My girlfriend keeps pressuring me to take her home to meet her parents and I finally had to tell her to hold her horses. The policeman told everyone to hold their horses while he surveyed the crash site. If you found this idiom useful, sign-up for my free newsletter to learn about new idioms and updates to my website. You'll also find out when I launch my writing contests and courses. Practice time! Remember, practice makes perfect. Write your own sentence(s) in the comment boxes below and I will also give you feedback. Practicing is the best way to learn and remember new idiomatic expressions.